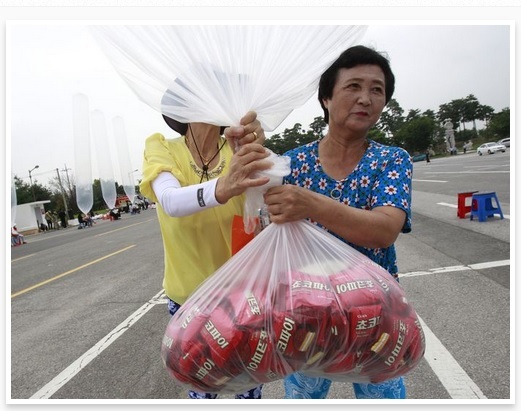 Choco Pies – banned as a capitalist symbol by North Korea after being traded at inflated prices – carried in balloons across border. South Korean activists have launched balloons across the border withNorth Korea carrying thousands of Choco Pies – a favoured chocolate snack that has become the target of a reported crackdown. 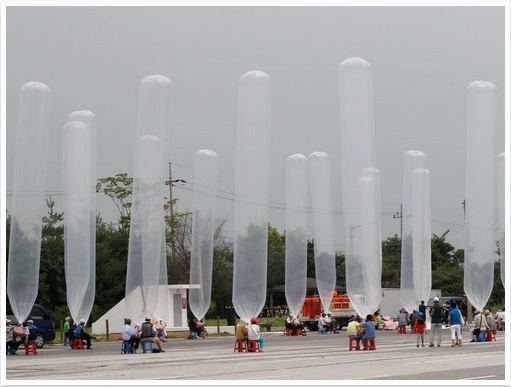 About 200 anti-Pyongyang activists released 50 helium balloons carrying 350kg (770lbs) of snacks, including 10,000 Choco Pies, from a park in the border city of Paju, organisers of the event said. The humble Choco Pie – a confection of chocolate-coated cake and marshmallow – has become an oft-referenced footnote in the volatile history of inter-Korean ties. Offered as perks to North Koreans working in South Korean factories in the Kaesong joint industrial zone, Choco Pies spawned their own black market and were traded on at sharply inflated prices. According to media reports in Seoul, the emergence of the South Korean snack as an unofficial currency became too much for the authorities in Pyongyang, who in May ordered the factory owners to stop handing them out. “Embarrassed by the growing popularity of Choco Pie, North Korea banned it as a symbol of capitalism,” said Choo Sun-Hee, one of the organisers of Wednesday’s balloon launch. “We will continue to send Choco Pie by balloons because it is still one of the most popular foodstuffs, especially among hungry North Koreans,” Choo told AFP. The Choco Pie stunt is not an isolated incident. 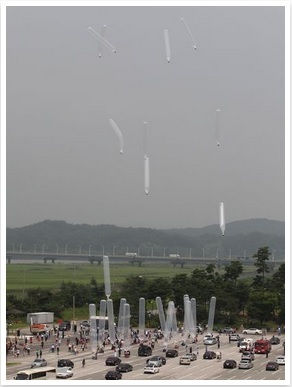 In 2008 South Korean peace activists used helium balloons to send information pamphlets from the south to people in the north. 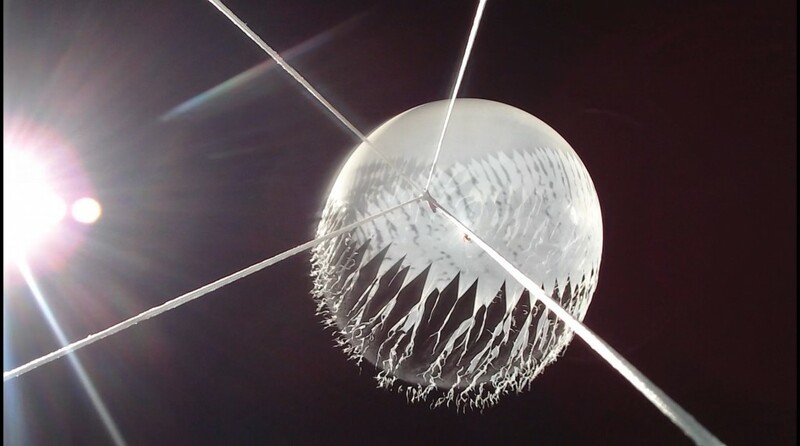 The activists used similar plastic balloons and sophisticated release mechanisms. High Altitude Ballooning is an increasingly popular hobby (I nearly said that interest has been “ballooning”, but fortunately I stopped myself just in time …), bringing what is termed “near space” within the reach of pretty much anyone who is willing to put in the effort and spend a moderate amount of money. 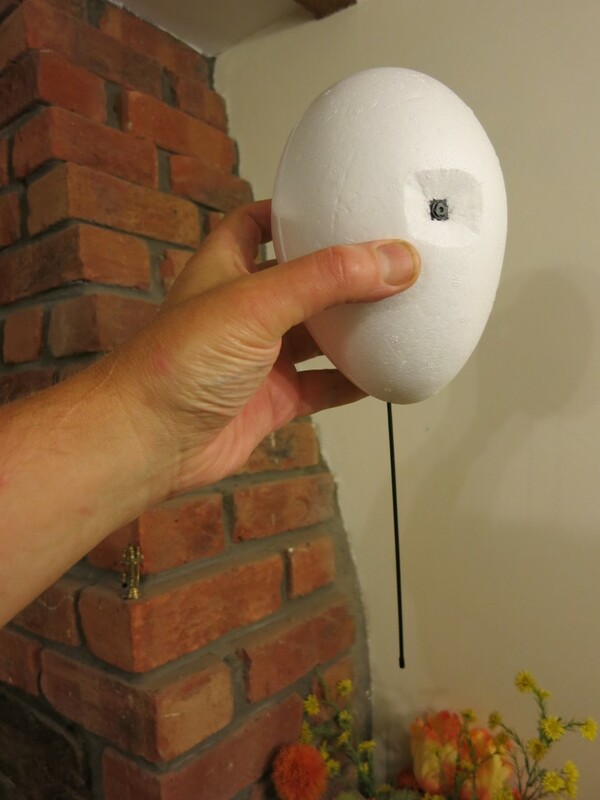 Although it’s possible to successfully fly and retrieve a balloon with a simple GSM/GPS tracker, the chances are that this will end in failure and tears. GSM coverage in the UK is nowhere near 100% especially in rural areas which is where we want (and aim) the flights to land. 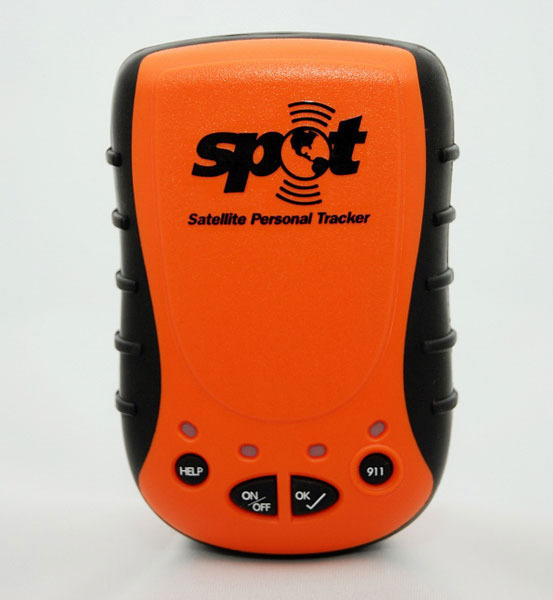 The next step up, in reliability and price, is a “Spot” tracker which works solely via satellites, but those don’t work if they land upside down. Also, neither of these solutions will tell you how high the flight got, or record any science data (e.g. temperature, pressure), or indeed tell you anything about the flight until they land. If you’re lucky. A lost flight is a sad thing indeed. For some countries (e.g. USA, but not the UK), if you are a licensed amateur radio operator you can fly an APRS tracker, in which case the flight will be tracked for you via the ground-based APRS network run by other radio hams. 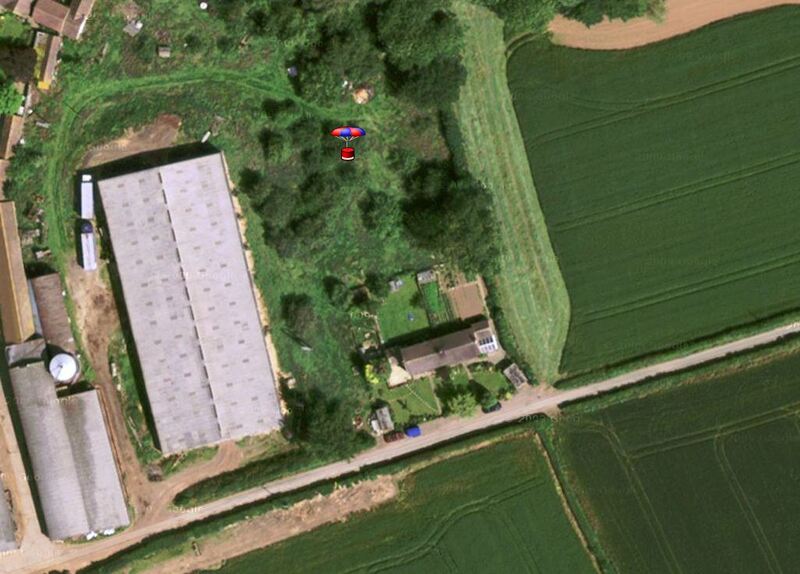 Sadly UK laws prohibit radio hams transmitting from an airborne vehicle, so APRS is out for us. What’s not shown here is that, provided you tell them, the other balloonists will help track for you. 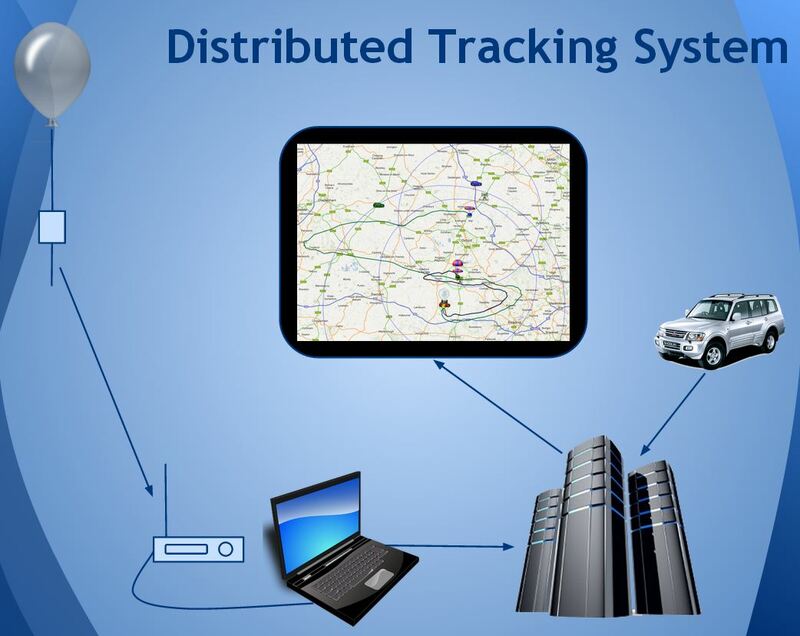 So not only will you be receiving telemetry and images directly via your own radio receiver, but others will do to. All received data is collated on a server so if you do lose contact with the flight briefly then it doesn’t matter. However, this does not mean you can leave the tracking up to others! You’ll need to receive at the launch site (you have to make sure it’s working!) and also in the chase car once it lands. The expense of doing this is small – a TV dongle for £12 or so will do it, with a £15 aerial and a laptop, ideally with a 3G dongle or tethered to a phone. Traditionally, balloonists build their own radio trackers, and for anyone with the skills or the time and ability to learn programming and some digital electronics, this is definitely the most rewarding route to take. 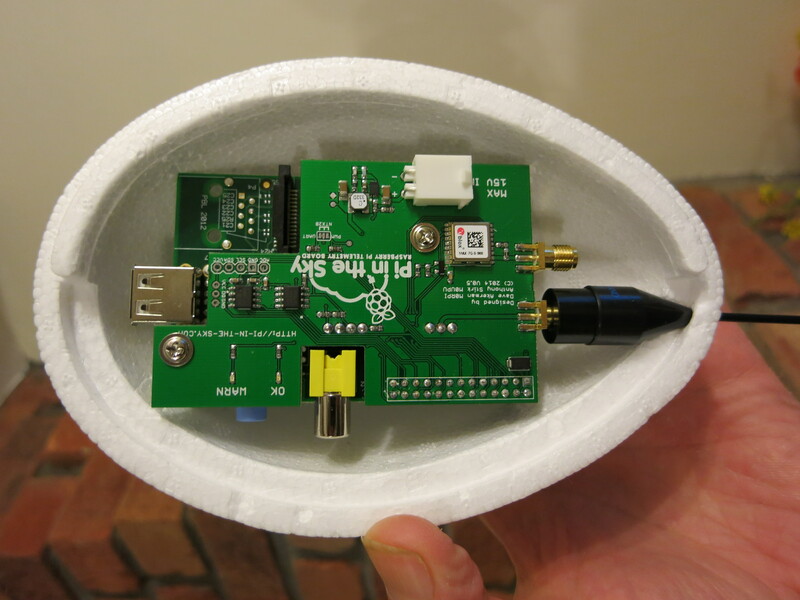 Imagine receiving pictures of the Earth from 30km up, using a piece of kit that you designed and built and programmed! So if you are up to this challenge (and I suspect that most people reading are) then I recommend that you do just that. 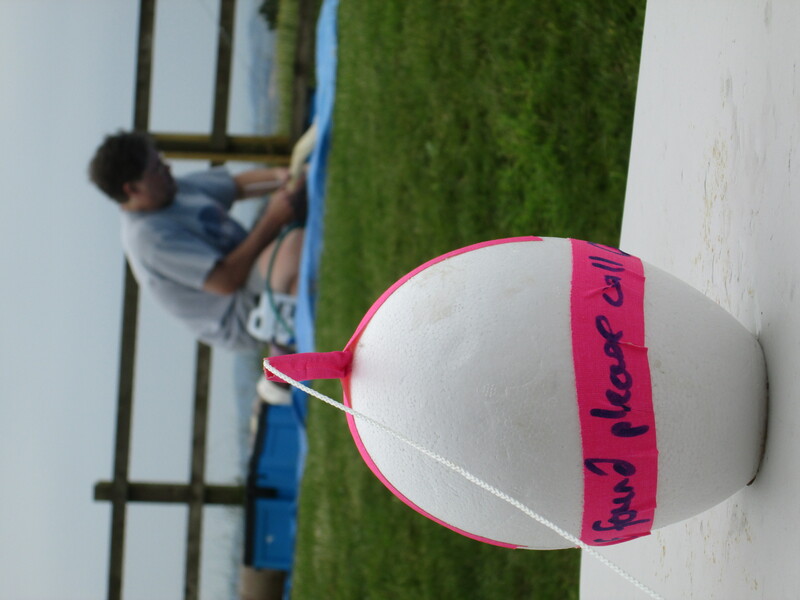 It takes a while, but during the development you’ll have plenty of time to research other aspects of the hobby (how to predict the flight path, and obtain permission, and fill the balloon, etc.). And when you’re done, you can hold in your hand something that is all your own work and has, to all intents and purposes, been to space. For some though, it’s just not practical to develop a new tracker. Or you might be a programming whizz, but not know which end of a soldering iron to pick up. 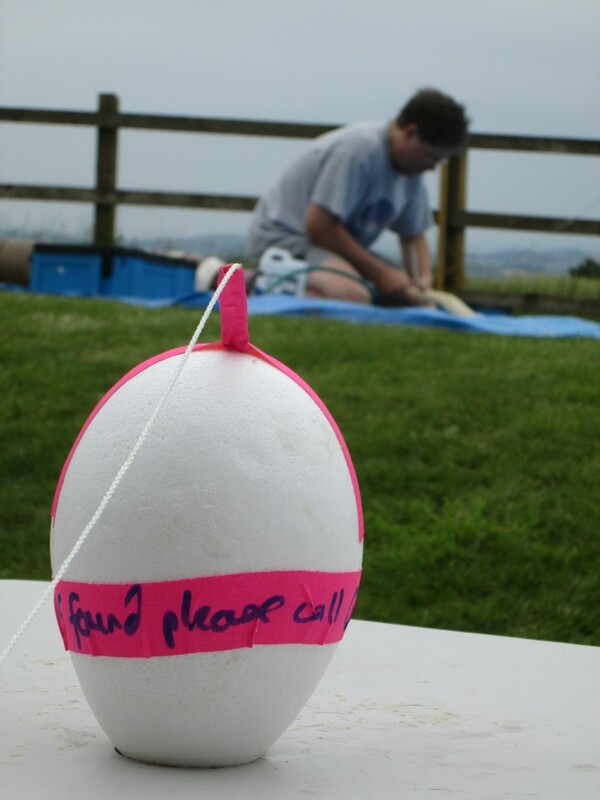 It was with these people in mind that we (myself and Anthony Stirk – another high altitude balloonist) developed our “Pi In The Sky” telemetry board. 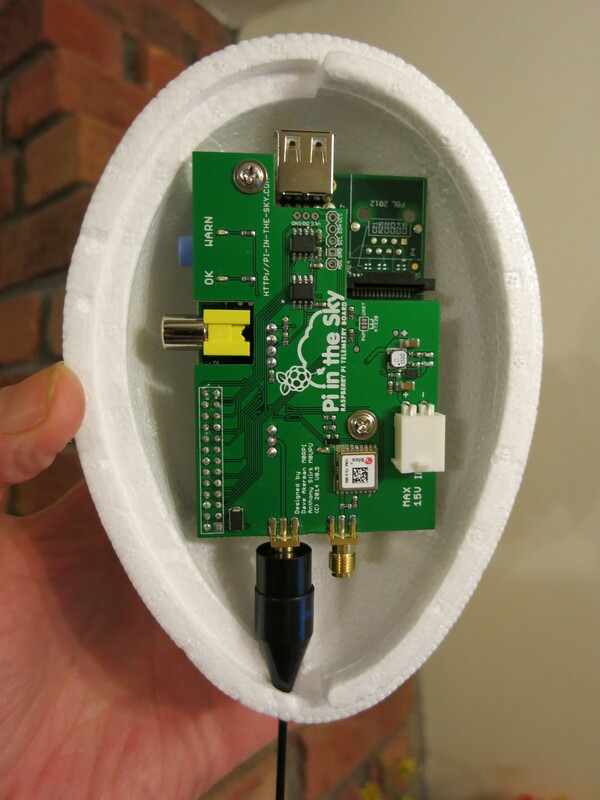 Our principle aim is to enable schools to launch balloon flights with radio trackers, without having to develop the hardware and software first. It is also our hope that older children and students will write their own software or at least modify the provided (open source) software, perhaps connecting and writing code for extra sensors (the board has an i2c connection for add-ons). By now you’re probably itching to buy a board and go fly it next weekend. Please don’t. Well, buy the board by all means, but from the moment you decide that this is the project for you, you should task yourself with finding out all you can about how to make your flight a safe success. For a start, this means learning about applying for flight permission (which, if you want to launch from your garden at the end of an airport runway, isn’t going to be given). Permission is provided together with a NOTAM (NOtice To AirMen) which tells said pilots what/where/when your launch will be, so they can take a different path. You also need to learn about predicting the flight path so that it lands well away from towns or cities or motorways or airports. I hope I don’t need to explain how important all of this is. What size balloon? What size parachute? How to tie it all together? 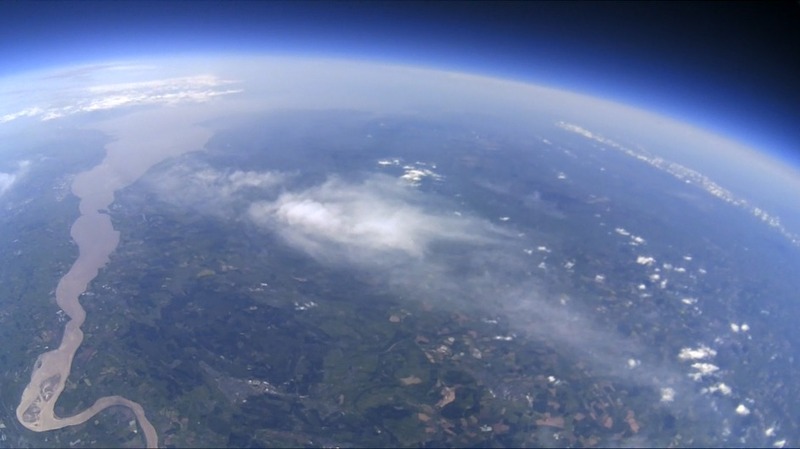 Finally, anyone interested in high altitude ballooning, using our board or not, should come to the UKHAS Conference on 16th August 2014 at the University of Greenwich. Anthony and I will be presenting our board during the morning sessions, and will run a workshop on the board in the afternoon. For tickets click here. 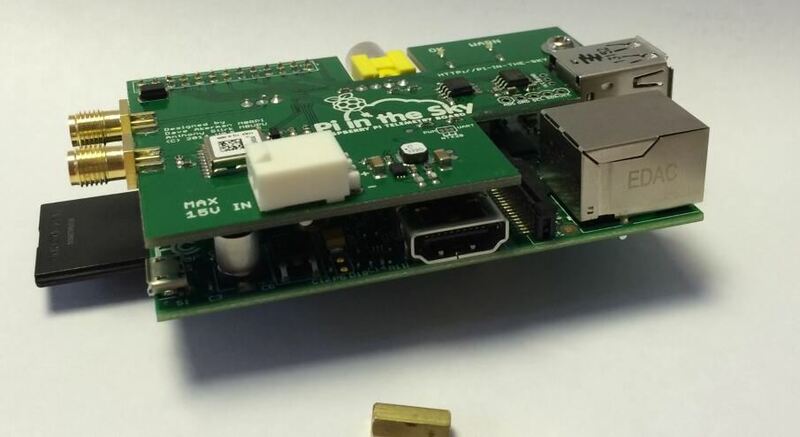 This was the third flight of the “Pi In The Sky” board, but the first flight of the new open-source software written specifically for it (previous flights used a modified version of my usual Pi tracker software). The new software is a single multi-threaded program (instead of a collection of separate programs) and is configured via a text file so that for most users no recompilation is needed. Once we had that information it only took a couple of minutes to locate the flight, which was on the ground with the line going over a bush. 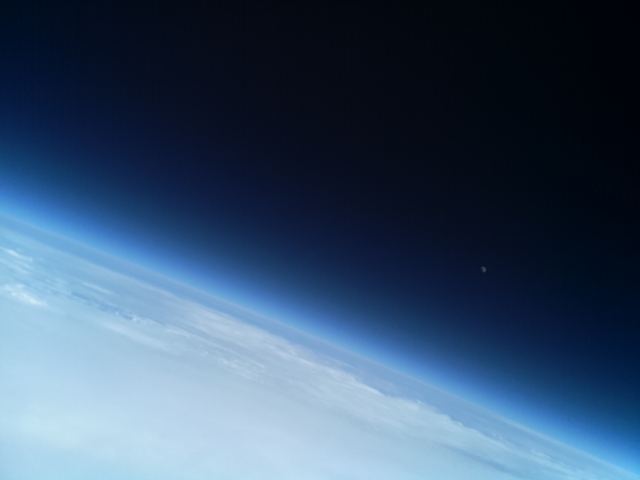 Andrew Huff, student at The Grammar School Leeds, has shown how the Raspberry Pi cut down computer can be used for an all in one offline tracker, camera, and GSM locator for high altitude balloon flights. Andrew picks up the story in his own words. 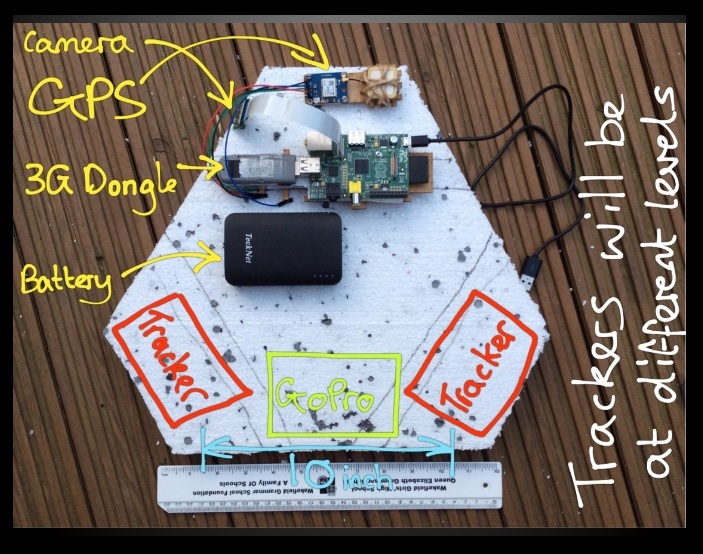 daddy of all Pi projects – to send it up 90 thousand feet into near space. being able to send me its position afterwards so that I could collect it. is allot better than the patchy GSM network which I settled upon using. so I soon settled on using that instead. The next problem came from having to interface with the GPS module. project would be at the beginning. 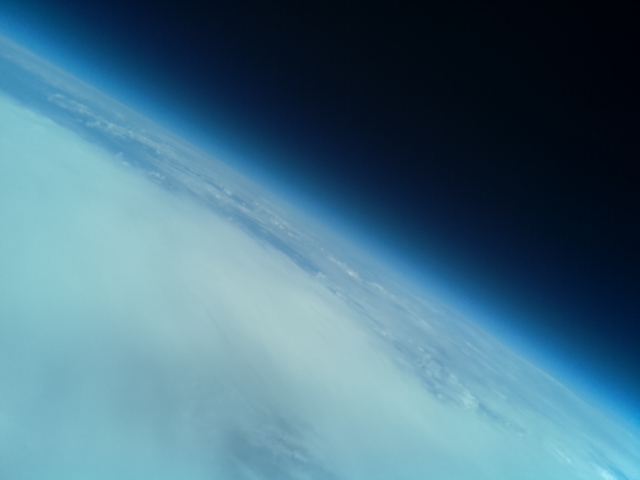 Which is the best SPOT tracker for your HAB – weather balloon flight? There was a time when you only had one choice when using SPOT as a tracker for your HAB flight. Then came the ever popular SPOT messenger and, along with the rise of action cameras, the hobby of HAB grew and grew. Now there are a plethora of SPOT devices to tracker your HAB flight including the GEN 3 and Trace. But which is best for your HAB flight? 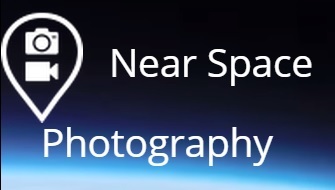 In a recent flight I used both the SPOT Trace and Messenger. Due to unforeseen circumstances the payload twisted to point to the horizon (and not straight up) so the results are unexpectedly good. 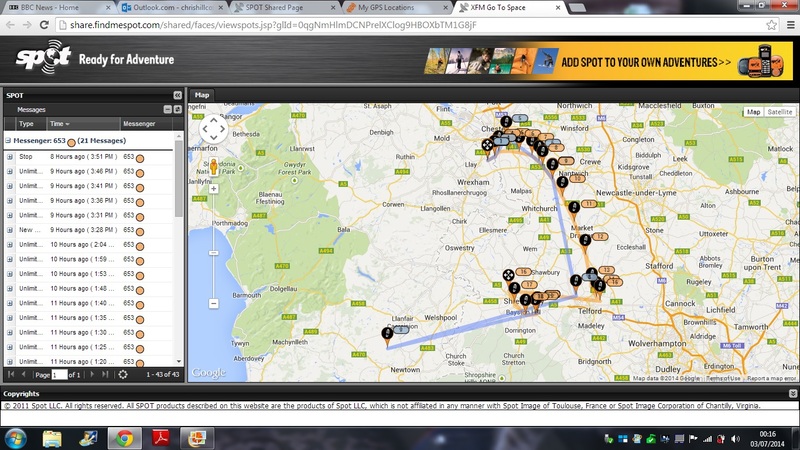 The results from the SPOT Trace, which was recording payload location every 5 minutes, was very impressive. 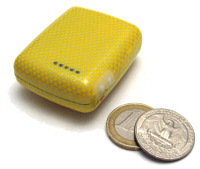 This has inspired me to test all the SPOT trackers on one flight. More details of the test will be posted closer to launch date. While writing a blog post on the ways HAB flights can go wrong, I came across an article by the Telegraph news paper on the cost of Met Office radiosondes landing and damaging people’s property. The figure of £25,000 worth of damage to 2010 seemed alarmist so I did some digging. 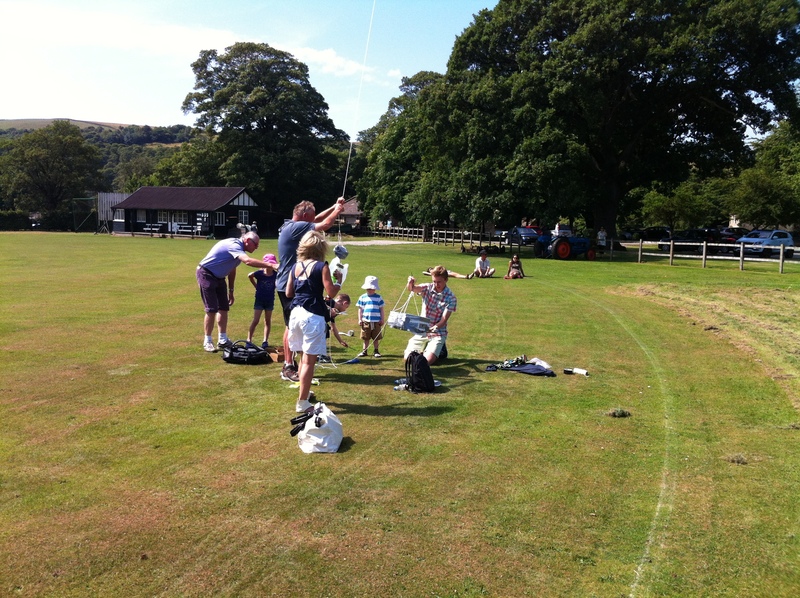 Data released to me by the Met Office under a FOI request suggests that high altitude ballooning is a low impact hobby. I asked the Met Office for information on insurance claims made as a result of their radiosonde programme during the years 2010 to the start of 2014. This is the response I got. 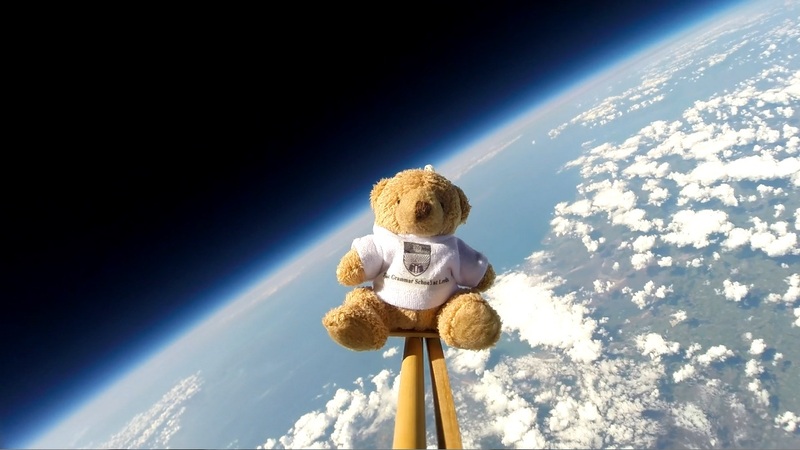 Given that the the frequency of high altitude balloon flight by the Met Office is much greater than the hobby community, we can assume that the amount of claims from hobbyists and the science community is much less. 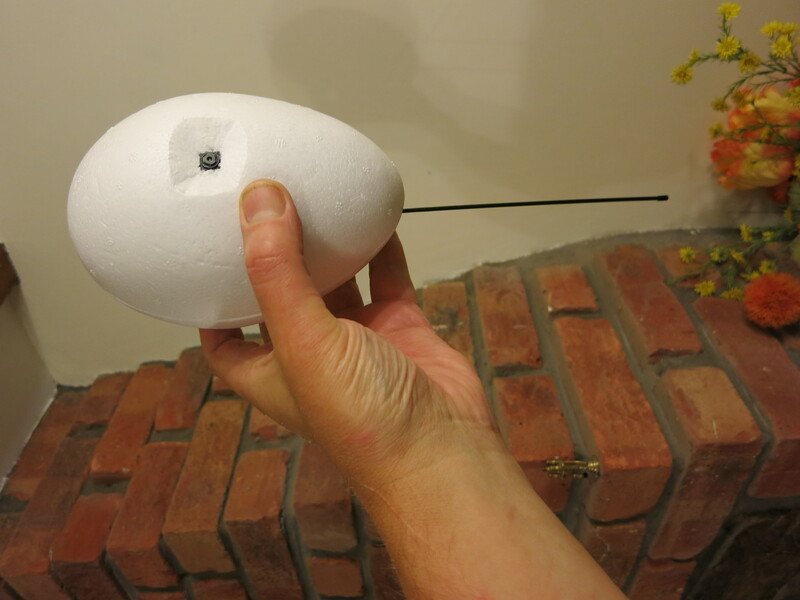 While I don’t have any data from hobbyists, I am happy to assume that the impact of HAB as a hobby is much less than the Met Office radiosonde programme.